Tight budgets can keep the reins on family entertainment and activities, but you don’t have to shell out a lot of money to have fun with dad. Dads love just about anything that involves having their family around. Just use your imagination and keep in mind dad’s interests and energy level when deciding which Father’s Day activities to pursue. Below are a few ideas that can be enjoyable yet inexpensive. Just remember that it is dad’s day, so if games are involved, let him win! Go wild at the local zoo: Let dad and the whole family enjoy a day at the zoo. Many zoos sell family passes. Stay as close to home as you can: Traveling to zoos in large metropolitan areas can be pricey, given the cost of admission and the gas to get there. 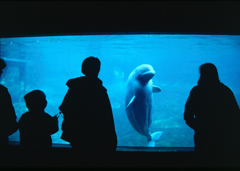 An aquarium visit can also be an enjoyable family excursion, particularly if the weather precludes outdoor activities. Check admission prices first to validate that an aquarium visit would, in fact, be a less expensive alternative than the zoo for a Father’s Day activity. Explore a farmers market and chat with a farmer: Many communities have farmers markets at this time of year. Typically, there is no cost to browse the stalls. The markets are often on weekends, and you may even find one open on Father’s Day. Visiting a farmers market can be a great way for the whole family to learn more about the benefits of organic and locally grown food. Even if you find prices for fresh produce a bit high, you could buy small amounts of fruits and veggies. Encourage your kids to chat with the growers; it may fire up the family’s interest in healthy eating. Dig up dad’s favorite old board game: Board game marathons are another fun Father’s Day activity. Select one of dad’s favorite board games from his childhood and challenge him to beat you. If dad’s old board games aren’t handy, you may be able to borrow some from friends or family or buy used games online. 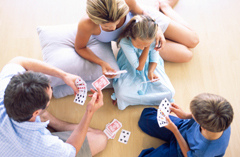 If board games don’t attract dad, you could always switch to other low-tech activities such as card games or Charades. The idea is to get everyone together on Father’s Day for an activity that’s inexpensive and just plain fun. Enjoy a breath of fresh air: Take advantage of warm June weather by enjoying nature. A family hike is a great way to get dad to forget the winter doldrums. Add an educational component to the outing by taking a guided tour of a nature walk, where the whole family could learn about birds, flowers and trees from an expert. 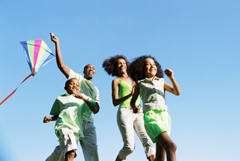 Go fly a kite: When was the last time that anyone in the family flew a kite? Watching a kite soar is wonderful for family togetherness. You don’t have to go any farther than an open area in your local park, but you will need favorable wind conditions. All kinds of kites are available, including online. Do a little research before purchasing a kite and don’t overspend. Or, consider making one from a kit, as that in itself can be a fun Father’s Day activity for the budget-minded. Get ready for a different kind of takeoff: This activity won’t cost a cent. Head to an airport to watch airplanes take off and land. This excursion can be particularly delightful for dads with small children since watching the planes go up and down will transfix the kids. Smaller airports might be best for this outing because they tend to be easier to access, as parking is less of a hassle. Whatever your plans for Father’s Day, consider asking members of your extended family to join you. Grandfathers, uncles, brothers and nephews will love to get in on the Father’s Day fun.